M105 is the large eliptical galaxy that is left and center in the frame. It is the brightest elliptical galaxy of the Leo I group and contains a massive black hole at its core. It is estimated to be 50 million solar masses dense. It also contains several young stars and star clusters. 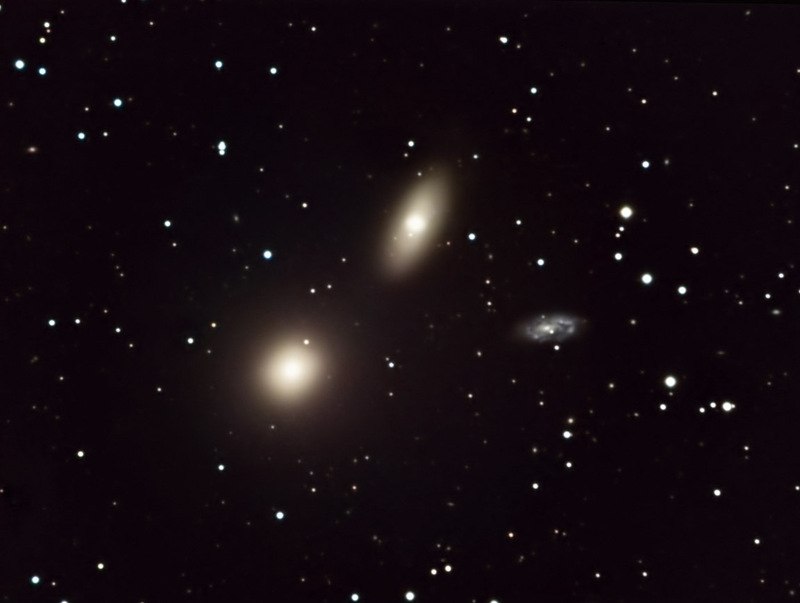 The galaxy to the upper right is NGC3384, another elliptical galaxy. The bluish spiral galaxy at the bottom is NGC3389. This is a more distant galaxy that is not an actual member of the Leo I group. Images were focused, calibrated, aligned, and combined in CCDSoft. The composite was adjusted in Photoshop. Noise was reduced using Topaz DeNoise. Vignetting was adjusted using Gradient XTerminator.